If you’re on Facebook or Instagram, you’re bound to see foodie photos. You might even snap the occasional foodie photo yourself. 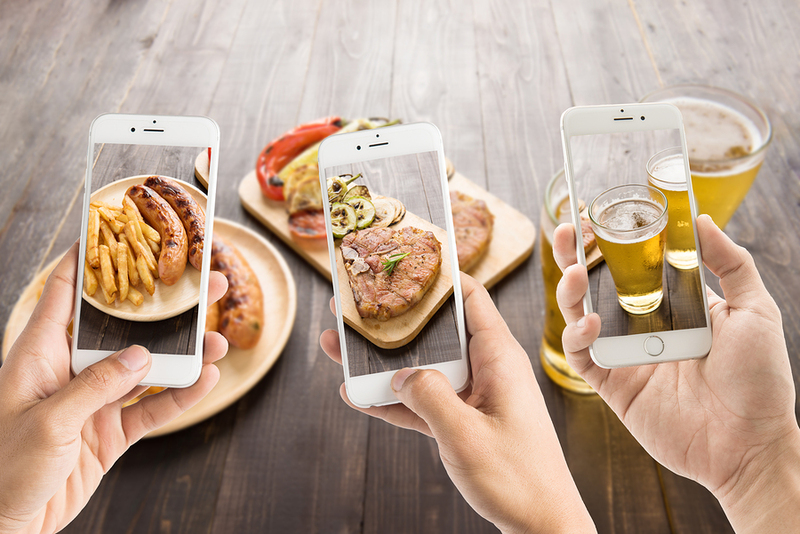 Whether you want to show off your hard-won kitchen accomplishment or to #humblebrag that you have a reservation at the most popular restaurant in town, a foodie photo is a fun way to share with your friends. Use natural light as much as you can. First, turn off your flash as its harsh light tends to give food a grainy look. If possible, place the dish next to a window or other source of soft, natural light. The best times of day to take this kind of a shot is mid-morning or just before sunset, but if it’s afterhours, try candlelight, or edit the shot with a cool filter afterwards. Don’t be afraid of props. Nothing makes a dish picture pop quite like a few props next to it. Nothing messy–no pencils or coins–just an accent like a tastefully ruffled napkin, or the raw ingredients that went into the making of the food, like a whole lemon or a branch of herbs. Food magazines do this kind of thing all the time, and it will work just as well on your photos! Shoot fresh food. When it comes to taking a shot of your food, don’t dilly-dally. Food can lose its visual appeal quickly, as cheese starts sweating and lettuce starts wilting. Food is meant to be eaten, so get the shot and dig in! Lock your focus and stay steady. Try the automatic focus lock on your smartphone in order to reduce the risk of blur, especially if you expect a minor element of the photo to move. You can also rest your finger or hand against the table or another stable object to help steady the phone while you’re shooting. There’s an app for this, of course. Consider downloading these apps that can help you get the most from your foodie shots. Check out VSCO (free for Android and iOS) which claims to be “the premier way to shoot, edit, and share your photographs,” or Snapseed (free for Android and iOS), which offers filters and sophisticated editing tools. Armed with these tips, you just need to add food (and perhaps a little practice), and you’ll have mouth-watering foodie photos in no time!